Willy Roscher learnt the game of chess during WWI as a soldier. He was a chess historian and had a large collection of chess books and knowledge about the history of chess literature and chess composition. He was the editor of the “Arbeiter-Schachzeitung” and composed direct mates. Alexey Kopnin was the editor of chess problem columns in newspapers, an International Judge and a composer of endgame studies and problems. Three black corrections. Flight giving key. A nice combination ending with 6 consecutive checks. 10. Rg8+ Kb7 11. Rb8+ Kxa6 12. Kxc6 wins. 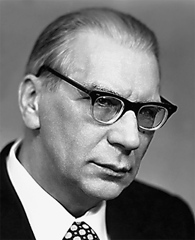 Harald Grubert composes mostly helpmates. Cycle of white moves ABC-BCA-CAB. Amatzia Avni is an endgame studies composer and a psychologist. He is FIDE Master both in composition and in o.t.b. chess. He wrote “Creative Chess” (1997) which discusses the characteristics and processes of creativity and proposes techniques to develop one's creativity in chess. 6... Bxd8 7. Rxd5+ wins the bB. 5. b4 ! and if Black moves Bc5, White is stalemated. Alexander Bacharev composes mostly direct mates.